Looking for a good real estate marketing strategy? One that you can market to the masses without going broke? Well, here's one that will work with FSBOs, Renters ,Buyers, and even Sellers. This real estate marketing strategy is for agents with limited budgets. That's most people I know! J Here goes! Sponsor A Workshop for ____________ (fill in the blank with renters, FSBOs, 1st time home owners, buyers interested in condos, etc.). Advertise it in your local newspaper and note that seating is limited. Require attendees to call and RSVP their intent to attend. Make sure that they provide name, mailing address, phone numbers, email address and the kind of information they're most interested in. What would any real estate marketing strategy be without collecting names and contact information? The workshop should be relatively short; 60-90 minutes long. Provide a movie, popcorn and a sitter for kids so that parents won't have to worry about getting a babysitter. More parents are likely to attend if they know "child sitting" will be available. It should should be long enough to share useful information, but short enough that you won't stress about how you're going to fill the time. Host the workshop in your office if you have adequate space. If not, the local library, a Title Company, Mortgage Company or similar other location will suffice. Do not rent a space. Instead, try partnering up with one of these providers as a co-sponsor and use their space and have them provide the refreshments. After all, each attendee is a prospect for their products and services, too. In the workshop instruct attendees on the dos and don'ts of selling their properties; establishing the right price, creating curb appeal, staging a home for sale, establishing how and when to show their properties, and more importantly how to be safe when showing properties. If it's buyers go the route of expressing the benefits of home ownership. One objective of the workshop is to give each attendee essentially the same information you give when you go on listing presentations. It's kind of like a listing presentation in reverse, but instead of you going to them they come to you as a group. So, at the end of it each attendee will have a greater appreciation of the advantages of using a Realtor, your marketing plan, contact number, email address, etc. Follow up with a series of letters to continue building the relationship. As a general rule it takes 4 - 7 contacts before you develop enough rapport with prospects to earn their business, but it's well worth the effort. You can also make it easy on yourself by using pre-written real estate marketing reports as collateral marketing materials, reports that are ready made to copy, paste and send. These Prewritten Real Estate Marketing Reports are perfect for this Real Estate Marketing Strategy! 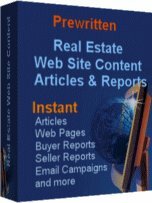 275 Real Estate Marketing Reports ready for instant upload to your web site. Create Special Reports for Buyers, Sellers, Investors and Renters. Convert more prospects to Buyers and Sellers with these informative, high value marketing materials. Remember, every attendee will be a potential customer for you; as a seller and/or as a buyer. Some agents think that an effective real estate marketing strategy has to be expensive and complicated. Hopefully, we just dispelled that notion. Do you know of another Realtor that host events like this on a regular basis? How about one who hosts an Open House for his/her office? Okay, then how about one that conducts workshops on how to finance home loans? No? That's what I thought. So, what are you waiting for. The audience and prospects are all yours! Hopefully, you can now see the near endless possibilities of this real estate marketing strategy for self promoting your services. And if you institutionalize it, it could be the thing that distinguishes you from your competitors. Drop me a line, or call me at 352-283-9316 and share how this real estate marketing strategy works for you. You probably know, intuitively if nothing else, that Farming Expired Listings is another real estate marketing strategy worth considering. But you probably think that every other agent knows this too, and are probably already working expired listings to the point of them being overworked. Well, you're right - kind of! Many agents know about expireds, but few have good systems and fewer still work them consistently. Ask around your office and you'll quickly discover that I'm right. I think there's always room for someone with a good system who works it consistently, five days per week. Below is information about the one I used, but please feel free to look around to se if there are others that catch your interest. The most successful real estate agents have lots of listings, and although getting them is easier said than done, it's relatively easy to do - at least with the right system! One system that works to near perfection is the Farming Expired Listings System, with letters. Learn how it can boost your business, too! Interested in just Expired Listings? Well, I made these available for separate purchase from the system described above. You can click on the link below to read more about them. Expired Listings Letters can help you get more prospects, sign up more listings and make more sales. These particular ones have helped some agents generate 2 or more listings a week, and in some instances without cold calling or cutting fees just to get the listings! Some say Expired Listings are easy to get, as the Owners are already Realtor friendly and more motivated to sell than before. Need Listings? 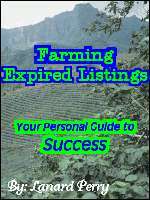 I averaged 2 Plus Listing a Week Farming Expired Listings with This Listing System...and It Was Easy To Do!